Every Day at 18:00 PM and at Noon Wed-Thu-Fri (Please verify time at the casa for any changes) a rosary is prayed at the main hall of the casa. 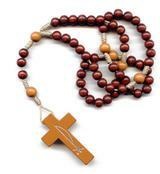 The rosary is recited in Portuguese but everyone is welcome and encouraged to join in. The rosary is a time of deep prayer for people at the casa and a great opportunity to practice an connect with the entities outside of the current times. Please plan to arrive a little early so the prayer can start on time.